With proper care a Mamamokum woven item will enjoy many years of use. Please follow our washing instructions carefully as we do not endorse any other method of cleaning for our pieces. Our fabrics have been carefully finished - washed, shrunk to the correct length, hard pressed, and are ready for use. When required, we recommend our products be handwashed in cold water using a gentle liquid detergent, free from enzymes and optical brighteners. Do not soak and never add bleach, fabric softeners or conditioners. After rinsing in cold water, gently squeeze the excess water from the wrap – do not wring. Roll the item in a large beach towel and press to remove moisture, lay flat in the shade over a clothes rack to dry. Iron using a low to medium heat. This is the most gentle way you can care for your special pieces, where the fibres will retain their original lustre and vibrancy over time. 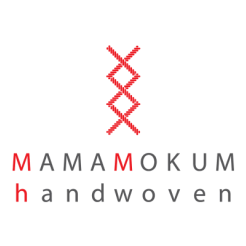 Mamamokum Handwoven items are crafted with the greatest care and eye for detail. Quality control is a part of each step of the process, the yarn or woven cloth repeatedly being inspected. Our fabric is unique and bespoke, each item we create is individual and shows signs it is made by human hands. All our babywraps are sold with a repair kit, please follow all care instructions carefully. Fluffy ends of bobbin changes and supplementary ends may poke through with use , this is normal. Simply weave these back in using the supplied blunt darning needle or carefully trim off. In the event of a broken thread, take a length of the supplied matching yarn and weave it in alongside the two broken ends using the needle, following the pattern and being careful not to pierce the other threads. In the event of a pull, use the needle to work along the warp or weft line, gently working the pull back into the fabric. Any shifting of threads can be tighten up again with a gentle wash and press. Do not hesitate to contact us for further instructions or with any questions!